IFP has taken a look at the front pages of newspapers on Saturday and picked headlines from 15 of them. IFP has simply translated the headlines and does not vouch for their accuracy. Air pollution in the southwest and government efforts to settle the problem dominated the front pages of Iranian newspapers on Saturday. At attack on a Shiite mosque in Pakistan along with the silence of some Western media outlets over the killings of three Muslims in Chapel Hill, North Carolina also appeared on the covers of dailies. Abrar-e Eghtesadi: Iran opens talks with three world electricity giants. Abrar-e Eghtesadi: European and US firms are forming coalitions to find their way back onto the Iranian market. Aftab-e Yazd: Two senior government officials are to visit Iraq to follow up on efforts to tackle the problem of particulates. The visits are part of broader efforts by the Rouhani administration to settle the air-related problems of Ahvaz, the provincial capital of Khuzestan. A dust storm in the city of late has reduced the quality of air there. Aftab-e Yazd: Iran offers discount to secure new oil markets. Asr-e Iranian: Western media have kept silent on the murder of three Muslims in the US. Asr-e Rasaneh: The preferential trade deal between Iran and Turkey might be reviewed. Asr-e Rasaneh: Car sales in Iran have registered a 32 percent hike. Asr-e Rasaneh: Fourteen local consortiums stand ready to invest in a gas pipeline project to export natural gas to Iraq. Asrar: “Faultfinding with the nuclear negotiating team is not logical,” said vice-president for parliamentary affairs. 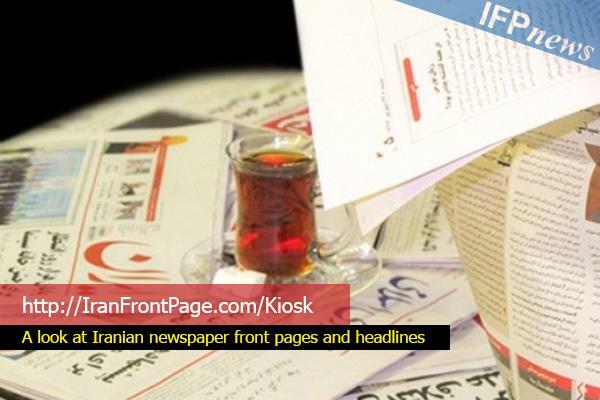 Asrar: The European Union has imposed new sanctions on the National Iranian Tanker Company. Ebtekar: “The Expediency Council is determined to supervise the workings of all three branches,” said the secretary of the council. Ebtekar: Opponents of a nuclear deal are tight-lipped. Following the recent comments of the Supreme Leader in which he supported a nuclear deal, the so-called Worriers [supporters of former President Mahmoud Ahmadinejad who are bitterly opposed to President Rouhani] are conspicuously absent in the media. Ettela’at: Don’t shed the blood of innocent Muslims and non-Muslims. In a message to the Iraqi army and popular forces fighting IS terrorists, Grand Ayatollah Sistani said those who specifically target non-Muslims are traitors. Ettela’at: Iraq’s Patriotic Union of Kurdistan has sent a letter of appreciation to the Supreme Leader. In the letter, the deputy secretary general of the union has said Iraqi Kurds owe a debt of gratitude to the Iranians. Hamshahri: The West has once again resorted to sanctions. Iranian students in Massachusetts were subjected to scientific sanctions, as the European Union placed the National Iranian Tanker Company on its sanctions list. Hemayat: “A two-phase deal is a Western ploy to push excessive demands,” said the deputy judiciary chief. Iran: “The legitimate rights of non-Muslim tourists should be respected,” said the first vice-president. Jomhouri Islami: An attack on a Shiite mosque in Peshawar has left scores of worshippers dead or injured. Jomhouri Islami: “There are no hurdles in the way of implementing the sentence of the former VP,” said the justice minister. Kaenat: The Iranian vice-president has met with Pope Francis. Kaenat: Renowned director Majid Majidi has been named administrator of National Cinema School. Khorasan: “By seeking a two-phase deal, the US seeks a repeat of the Oslo Accords,” said an advisor to the Supreme Leader. Sayeh: “The previous problems between parliament and government have been settled,” said the vice-president for parliamentary affairs. Fifteen months after the arrest of Babak Zanjani [who stands accused of massive corruption] his case has gotten more complicated with revelations that he has transferred oil money to foreign countries. Shahrvand: The names of 7-15 million Iranians appear in no databanks. This complicates efforts to eliminate high-income individuals from the list of people eligible for cash subsidies.